That's what everyone here in New England is asking - we have a hot humid day and then we are putting the blankets back on the bed and turning the heat on!?! 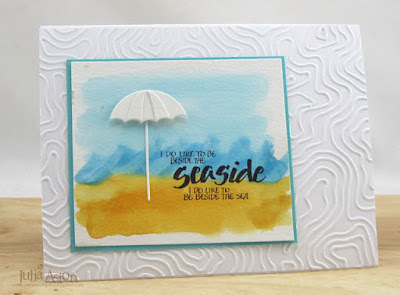 Well - summer is here on my card today! I water colored the background on water color paper - first brushing over the panel with water and then adding watercolor paint with a wet brush - tan for the sand - dark blue for the ocean waves and lighter blue for the sky. I added this cute little layered die cut umbrella - popping the top up on foam dots and this lovely seaside sentiment. I used a new embossing folder I just purchased called Level Curves. I thought it looked like a few things - a topography map, snail marks in the sand - and/or marks in the sand underwater after the waves have gone by! Anyway, I thought it added nice CAS texture in white! Use a die cutting machine - I used my Vagabond to cut my umbrella die. I retired last January (Yippee!) 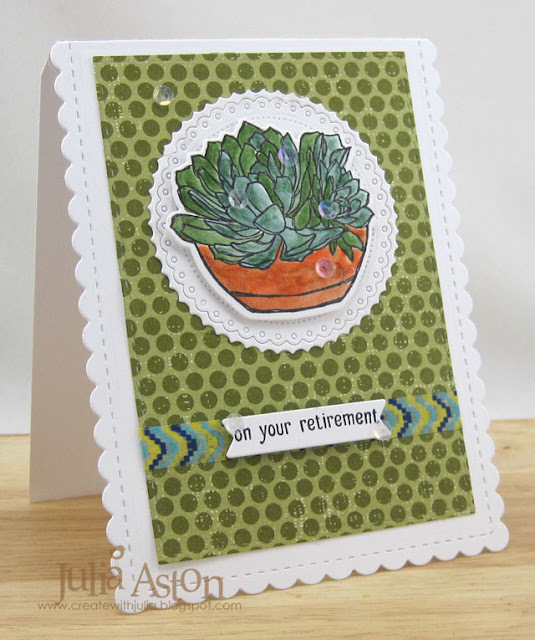 and on Tuesday a former co-worker is retiring and her department is having a party for her - so I needed a retirement card. 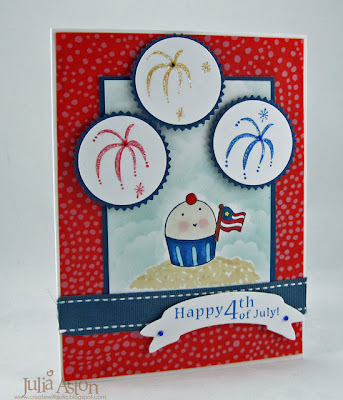 My card design was inspired by this card by Becky - the Featured Stamper over on Splitcoaststampers this week. I used a succulent rather than a cactus (or I guess a cactus IS a succulent??! ), changed the design slightly. I didn't make mine a shaker - but did add clear sequins scattered about to give the impression of a shaker! I colored my image using Tombow Markers and a Clear Glitter Wink of Stella to spread the color around - so IRL it is quite sparkly in the light! 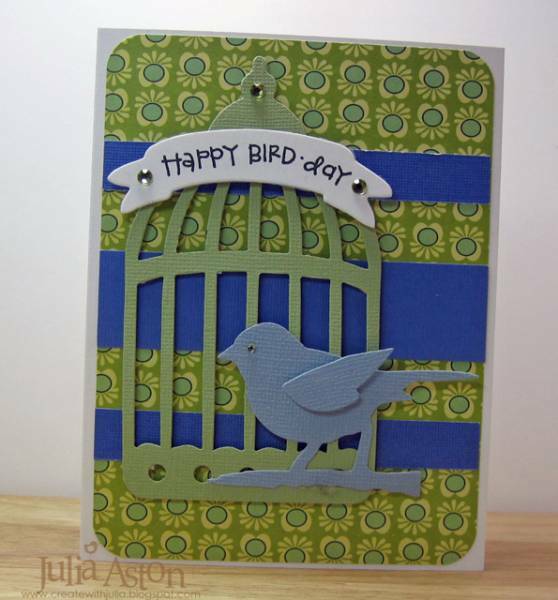 For this card I used stamps, corrugated paper, stenciling and a die cut. I just got this cute Little Bits Raccoon die from Taylored Expressions and thought it would make a great masculine Valentine for my husband, Kent. I stood him on a corrugated 'log' under the tree I made with Wendy Vecchi's Layered Tree Stencil and WV Archival Inks. I made the log using the Key Tag punch from SU. I cut the tag in half to give it a flat top. I used a piece of corrugated paper that I've had in my stash for years and never opened! 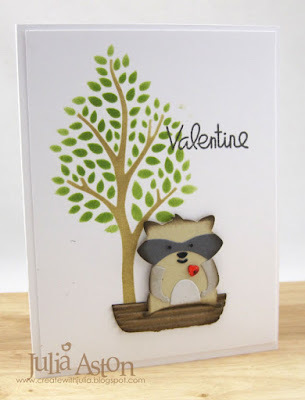 I added a rhinestone heart to the racoon and stamped my sentiment from Love Struck by Paper Smooches over the tree. This little guy just cracks me up! I layered him on the log with foam dots. I sponged around the edges of the raccoon and of the log with Ranger Distress Ground Espresso Ink. Paper: white, Fine Linen, Soft Stone, True Black - PTI, Basic Grey and Sahara Sand - SU, Corrugated Paper. Ink: True Black - PTI, Wendy Vecchi Archival Tree Branch and Leaf Green, Ranger Distress Ground Espresso. Accessories: Key Tag Punch - SU, Tombow Glue, Layered Tree Stencil - Wendy Vecchi/Stampers Anonymous, foam dots, rhinestone heart - Michaels. 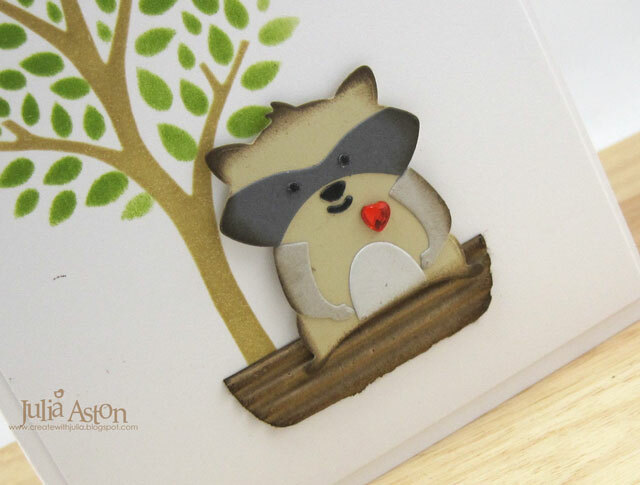 In the beginning of June, I got an e-mail from a K K Yuen in Hong Kong who has two fairly new Etsy shops - Stampcow where he sells hand made rubber stamps and Craftpon where he sells craft supplies. He said he had seen my blog and he asked me if I would be interested in receiving some items of my choice from his Etsy Shops at no cost if I was willing to post creations that I made with those items on my blog. After looking through the shops and finding some fun things- I said 'Yes' - I'd be happy to! So with that full disclosure - here is my first post using a sweet little duck stamp I received from Stampcow. The sentiment is from Taylored Expressions - from a stamp set that I just won when I guessed Taylor was having a second girl! How lucky am I?! 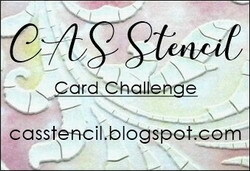 I used this weeks Cas(e) this Sketch for my card design today. 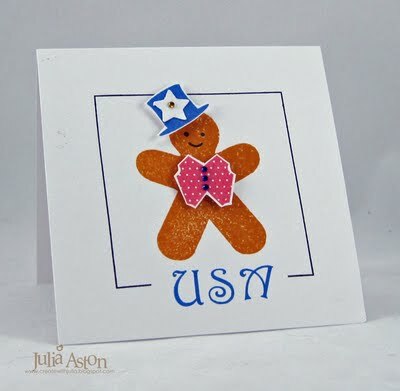 And just for good measure - I made a second card in blues for the boy babies! These will go into the box of cards I keep under my desk at work - I have several co-workers who buy my cards - and it's usually for birthday, baby or sympathy! Today is Kent's and my 16th wedding anniversary and tonight we're going out to dinner and a play with my college roommate and her husband. We made the plan to get together coincidentally but it will be a nice way to celebrate! The play is called "These Shining Lives" - here is a brief description of this true story - " In the 1920s, The Radium Dial Corporation employed some 4,000 girls and produced watches with brightly lit dials. These were jobs for girls that had never worked before. They didn't just make money; they made friends. But the radioactive paint they were using made them terribly ill. These Shining Lives tells the story of four women who rejoiced in their new-found camaraderie and found the courage for each other to stand up to the employers that endangered their lives." Sounds interesting doesn't it? Stamps: Duck - Stampcow.com etsy shop, Sentiment from Welcome Little One Set -Taylored Expressions. Paper: white - PTI, DP Sidewalk Paper Pad - October Afternoon. Accessories: black rhinestones - Kaiser Craft, foam tape, blue Adonit Gems, wrinkled seam tape - Prairie Bird Boutique Etsy Shop. 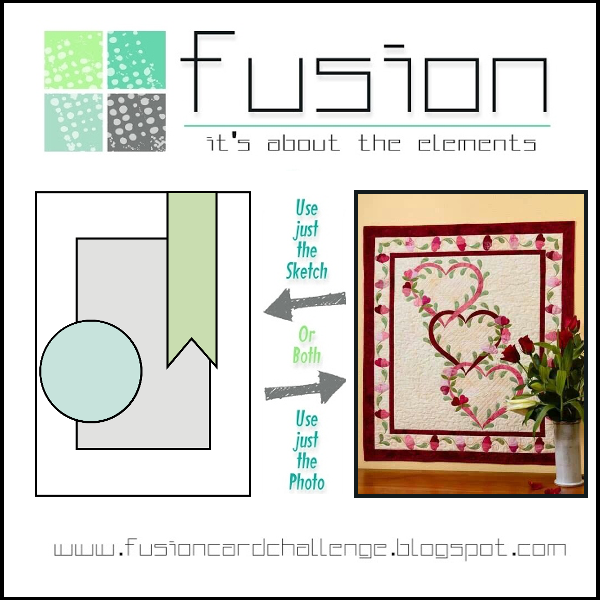 I was SO excited to see the Chalkboard Technique as the Technique Lovers challenge over on Split Coast this week. I've had this tutorial by Betsy Veldman printed out on my desk for a while now. So Joan's challenge made me finally sit down and try to do it! 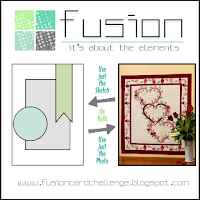 You'll find all kinds of chalkboard cards in the SCS challenge gallery here. What you see here is my third try at it - the first one wasn't spaced well and the 2nd one I tried over stamping the white embossing with Fresh Snow ink and I WAY OVER over stamped it! 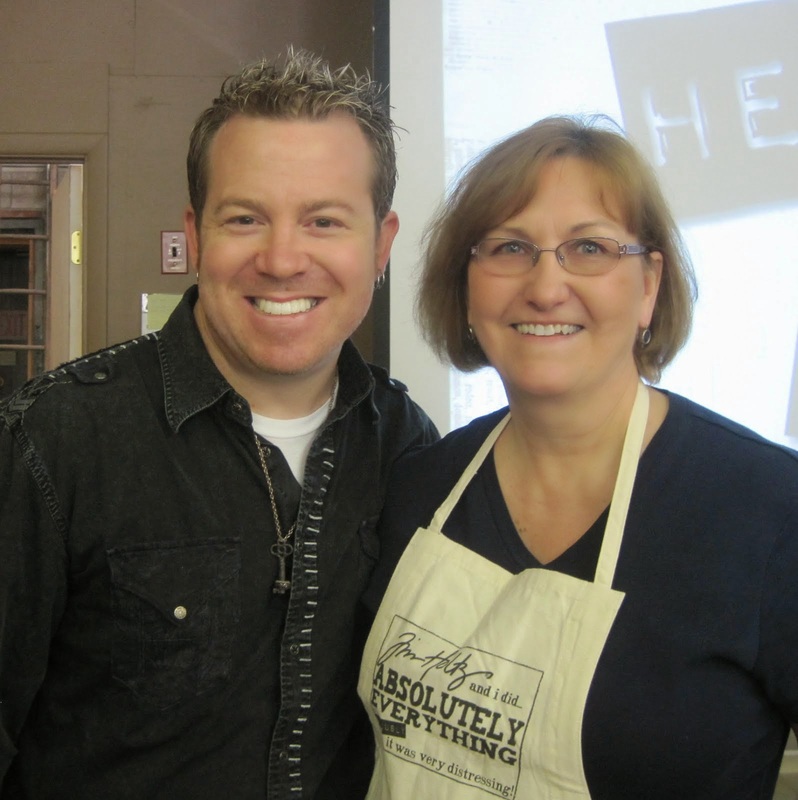 So - it's a process that I think you get better at the more you do it! First I stamped the sentiments with Versamark and embossed them in white. Then I stamped the banner over the HAPPY BIRTHDAY using Fresh Snow - I didn't get it quite centered over the sentiment so I added the pink heart gems to off set it! I cut off the side edges up to and around the banner ends so they stick out. Next I drew the framing lines with a white Prismacolor watercolor pencil and drew some red lines around NOISE and yeah BABY. I rubbed a little bit of Fresh Snow Ink around the edges and open spaces and finally added the ribbon and buttons with twine. 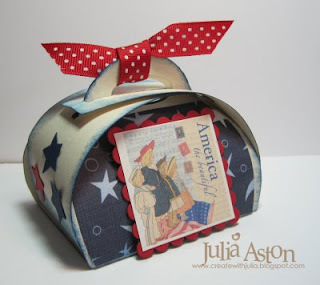 In honor of celebrating the 4th of July - the independence of the United States of America - I'm re-posting the projects I've made featuring the USA since I started my blog in 2008. 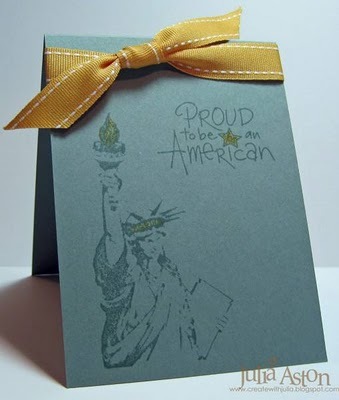 Happy 4th of July to everyone in the USA! 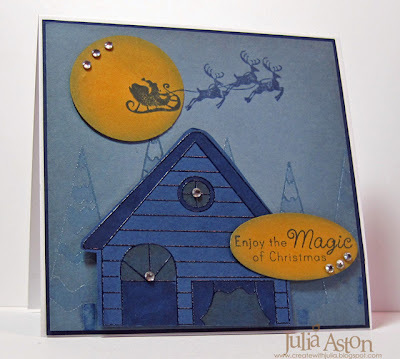 Stamps: Waltzingmouse - Half Baked Gingerbread Joy, Frame It, Victorian Alphabet. Ink: Adirondack Butterscotch, Memento Lady Bug, Danube Blue, Tuxedo Black. Accessories: Star Punch - McGill, tiny gems - Taylored Expressions, foam tape. 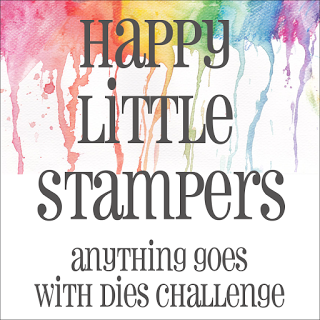 Stamps: Taylored Expressions - A Year of Sweets 2, A Year of Sweet Sentiments. Accessories - Circle and Pinking Circle Nestabilities, Nested Lacey Pennants (banner), rhinestones - Michaels, foam tape. Taylored Expressions Blast from the Past Blog Hop - Old Glory! 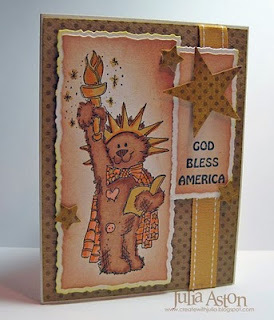 Today I'm participating in the Taylored Expressions Blast from the Past Blog Hop - the Theme is Old Glory. 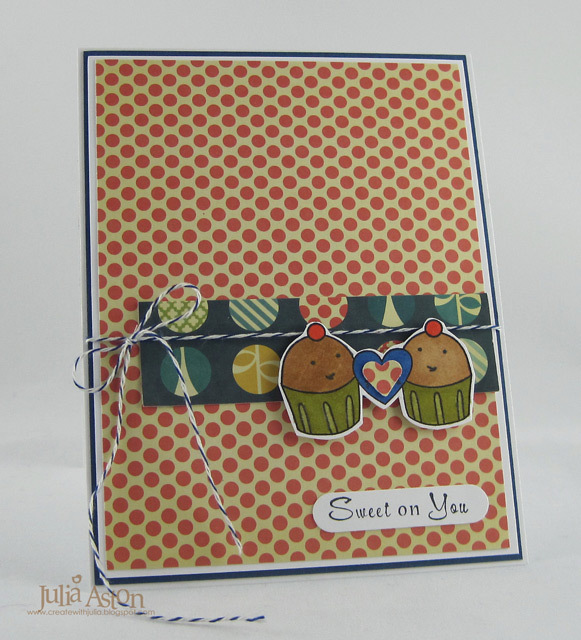 I used stamps from two TE sets on my card - A Year of Sweets 2 and A Year of Sweet Sentiments. I also used the Banner Day Die for my sentiment and Tiny Twinkles on the sentiment and fireworks. I also added some dazzling diamonds to my fireworks so they look really sparkly IRL - I think you can see it a little bit on my pic. Cuppie has hiked to the top of the hill to get a really good view of the fireworks this year AND he's waving Old Glory!! Wishing an early Happy 4th of July to everyone in the US ! The long weekend will be here soooooon!!! 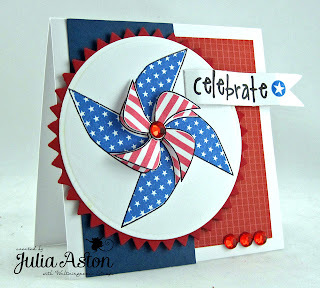 Taylored Expressions Blog Hop - Make it Masculine! Today I'm participating in the Taylored Expressions Blast from the Past Blog Hop - the Theme is Masculine. You have to use TE stamps released prior to March 2011. I didn't have any specific masculine stamps to use - so I used my cuppies to make an Anniversary card for Kent - our anniversary is coming up in June - so now my card is made! ( you know how we card stampers never seem to have cards for our own family?!?!?) 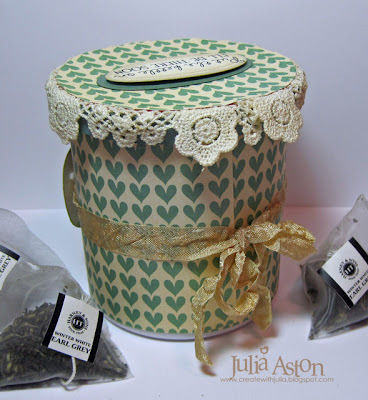 Inside I stamped 'match made in heaven'! Which is exactly what we have...! Here are all the bloggers participating in this fun hop today - let's go check out how to make it masculine - shall we??! Paper: White, Enchanted Evening - PTI, DP - Cosmo Cricket 6x6 mini deck Social Club. Today I'm excited to be participating in the Taylored Expressions Blast from the Past Blog Hop! I used the sketch that Sankari Wegman designed for the hop - which wecould use if we wanted. 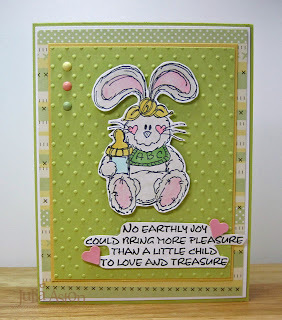 And I used the Taylored Expressions stamp set Sweet Spring. Poor bunny - someone has already taken a bite out of his ear! Somebunny really does love him!! Just click on the pic for a larger view. I added tiny twinkles to his eye and nose, the sentiment and the doily bunny is sitting on and die cut some grass along the top of the pleated ribbon. 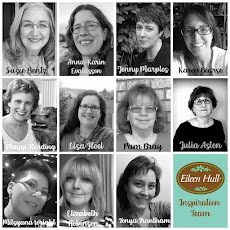 Here's everyone that's participating in the blog hop today - I hope you'll check them all out! 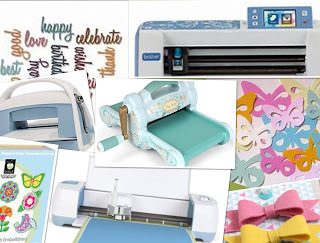 Accessories: Copics - E37, BG11, BG32, RV21, Tiny Twinkles & pleated ribbon - Taylored Expressions, large Oval punch - SU, Wrinkled Seam Tape - Prairie Bird Boutique Etsy Shop, scallope edge die - PTI, fresh cut grass die - MFT, foam tape, scor tape, Oval and scallop oval nestabilities. 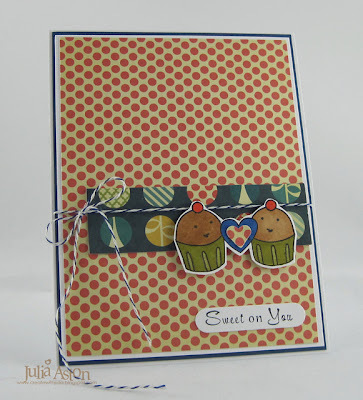 I made this sweet baby card for the Color Challenge on Split Coast this week - the colors Peggy gave us to use - So Saffron, Pretty in Pink, and Pear Pizazz. Great colors for spring aren't they?! I thought they were super for a new little baby card too! Just click on the pic to see it larger. I used this weeks Taylored Expressions sketch for my card. I colored bunny with Copics, cut him/her out and adhered him/her to the embossed panel with foam tape. I stamped the sentiment and cut it close to the edges all around. Something fun!!! The Friends of WMS Blog waltz is coming up in the Playroom of the WMS forum on 4/17 the theme is Easter! 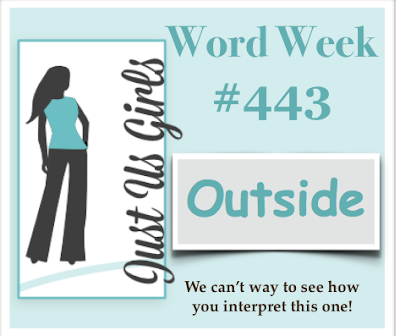 You'll find the deets here or just click on the Blog Waltz pic on my side bar! Hope you will join us in the fun! 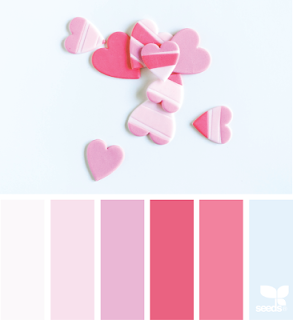 Paper: So Saffron, Pretty In Pink - SU, white, spring moss - PTI, DP Itsy Bitxy Bably Boy Paper Pack K+ Co. Accessories: foam tape, Swiss Dots - Cuttlebug Embossing Folder, Brads - Basic Grey, Copics: E40, G21, RV12, BG10, Y21, Heart Punch - McGill. I was the host for the color challenge over on Split Coast this week - my color choices were Marina Mist, Certainly Celery and Baja Breeze - I didn't have all of the SU colors - so I used some Bazzill papers - two shades of blue and a green and a pretty Cosmo Cricket patterned paper called Social Club. My dessert option this week was to have a bird on your creation. 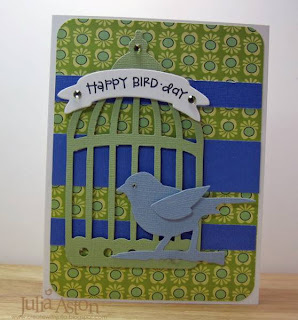 I used my Tim Holtz Alteration bird cage and bird die and a banner die from Taylored Expressions for the sentiment. 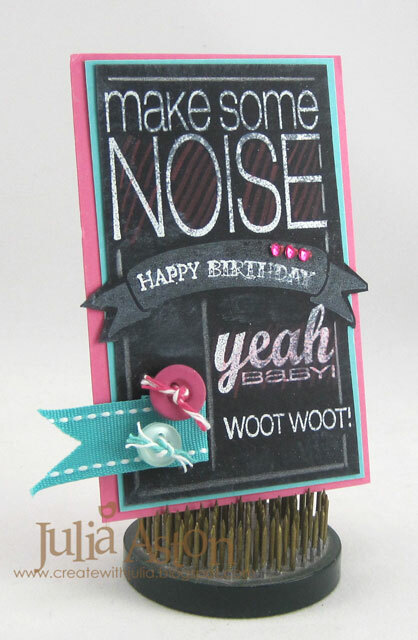 I used this weeks Crazy 4 Challenges sketch for my card design and my fun sentiment is from PaperSmooches - Birthday Buddies set. Hope you can stop by tomorrow - for the 1st four days of April - the Waltzingmouse Design Team is having the April Stamp of Approval Parade (SOAP!) 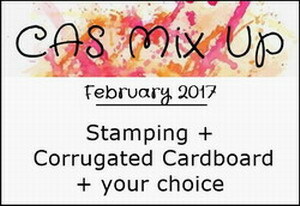 of the March WMS Release - come join the fun! 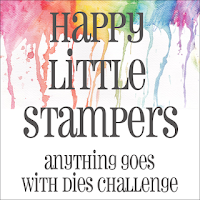 Welcome friends to Day 2 of the Rubbernecker Stamps Previews! 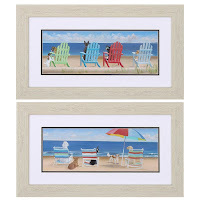 Rubbernecker is releasing more NEW STAMPS tomorrow - 3/29/11. You'll want to visit EVERY one of the FABULOUS design team participants and leave a comment, for on ONE of their blogs, is a chance to win a $15 Rubbernecker Stamps gift certificate! You can find the complete list of today’s participants on the RUBBERNECKER BLOG! Today I'm previewing stamps from a wonderful new set called Paris 1908 #527 Aren't these great vintage images?! I paired them up with these great Basic Grey Curio Papers. I used Friday's Taylored Expressions sketch for my card design. I stamped 3 of the images and then punched them with a 1 3/4" circle punch. I colored the people and tires on the car with copics, sponged all the edges and framed them with 2" punched circles. I stamped the Eifel Tower, cut it out and adhered it to the circle with foam tape. Then I added some tiny gems for a little Paris glam! You will find the list of all the Design Team members showing previews today on the Rubbernecker Blog - as well as details on 3 ways to win some stamps! 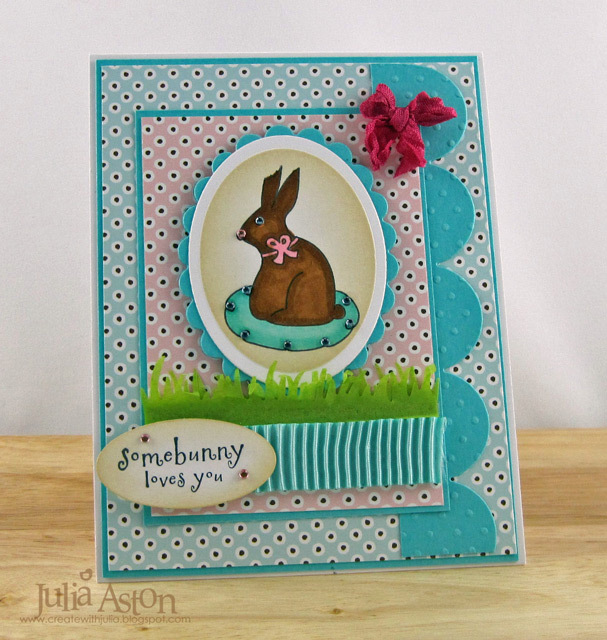 Thanks for stopping by, hope you enjoy all of our creations and that we'll see you tomorrow for the New Release Design Team Blog Hop! 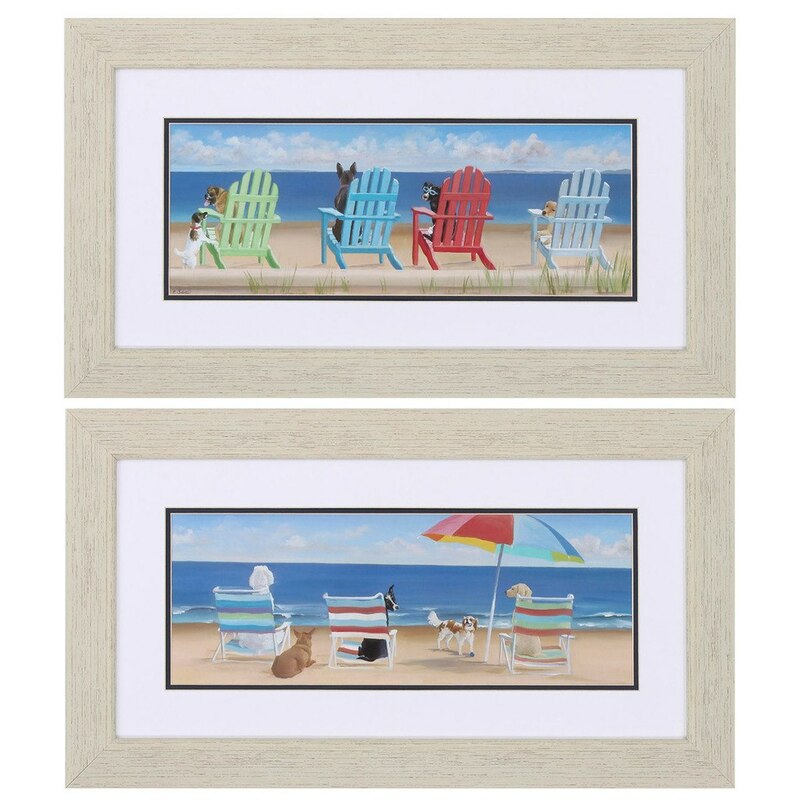 Don't forget to leave a comment for your chance to win! Au revoir, mes amies! Paper: Vintage Cream - PTI, DP Basic Grey Curio Paper Pad. Accessories: Copics - E34, E51, E53, Y21, R20, RV32, C1, foam tape, tiny gems - Taylored Expresisons, Quickie Glue Pen, 1 3/4" circle punch - SU, 2" circle punch - Fiskars., wrinkled seam tape - Prairie Bird Boutique Etsy Shop. TE Blast from the Past Blog Hop - The Magic of Christmas! 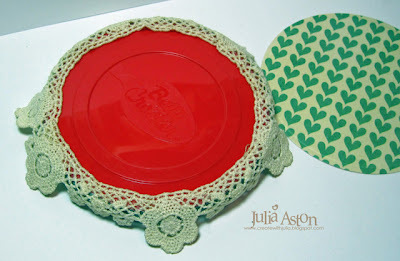 I'm so excited to be participating in the Taylored Expressions blast from the Past blog hop again! This month we were to use any Christmas/Holiday TE stamps on our card. I tried to create a night time Christmas Eve scene - using several hues of blue and clear embossing all the images so the details would show up in all the blueness. The house, moon and sentiment are popped up on foam dimensionals. I cut off the bottom half of the house to have room on my 4 1/4" x 4 1'/4" card for Santa flying overhead! All my images are from the set Holiday Wonder. I wanted to create the feeling of a late winter's night, with the cold crisp snowy woods when everyone in the house is sound asleep! Truly the magical time of Christmas. 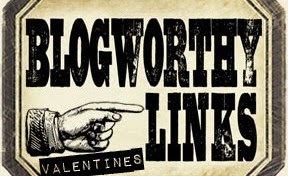 Here are the links to all the people participating in this fun blog hop today! I know you'll find a lot of great holiday card ideas if you hop! 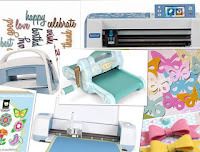 Accessories: Copics B21, B37, Y21, Circle punch, foam dimensionals, clear EP, hot gun, rhinestones - Kaiser, blending tool & non stick craft mat - Inkssentials Ranger. 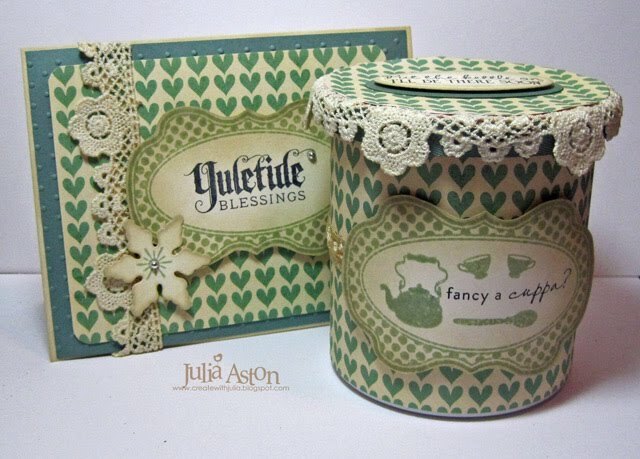 WMS Sneak Peek Day #2 - Yuletide Blessings & Fancy a Cuppa? Welcome dear friends to the 2nd day of Sneak Peeks of the Waltzingmouse October Release. Just 2 more days until you can order these for your very own! I used Taylored Expression's sketch for my Yuletide card. 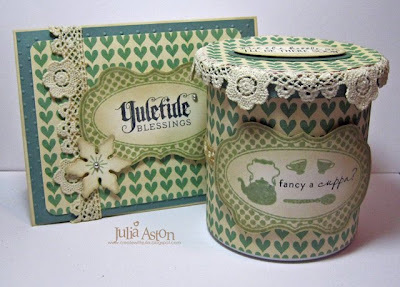 The sentiment and snowflake stamp are from Compliments of the Season and the cool label stamp is from Holiday Labels No. 14. I don't have the Labels 14 Nestabilities (yet!) - but it was easy peasy to cut around the edges by hand. 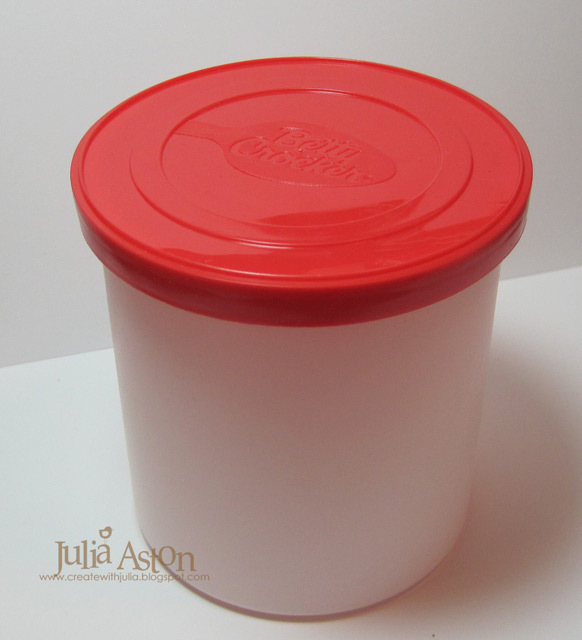 Here's how my container started out - as a simple Betty Crocker Icing tub! Since the top was red I really had to get it covered as red didn't go with my color scheme! I used some twill along the side edge and I attached this lace over the edge of the top, folding it down over the side and covering the top with a circle of designer paper. Then I just adhered a strip of the same paper around the base of the container. 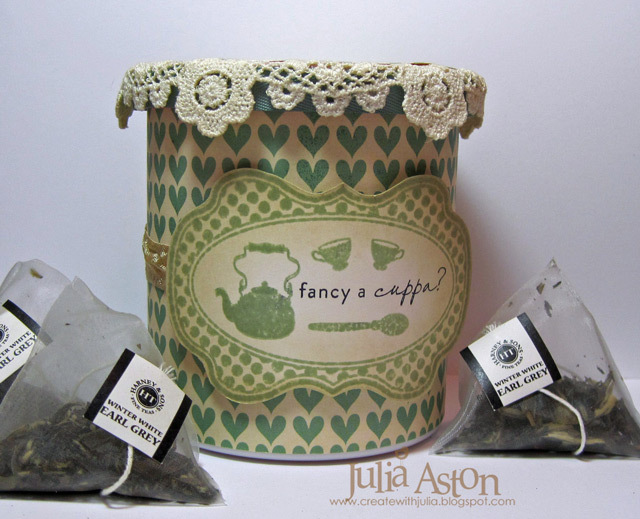 I used petite oval Nestabilities to cut out the sentiment (Afternoon Tea Sentiments) I used on the cover here. So that's it! sorry I took so long today! See you tommorrow for Sneak Peek Day #3!! 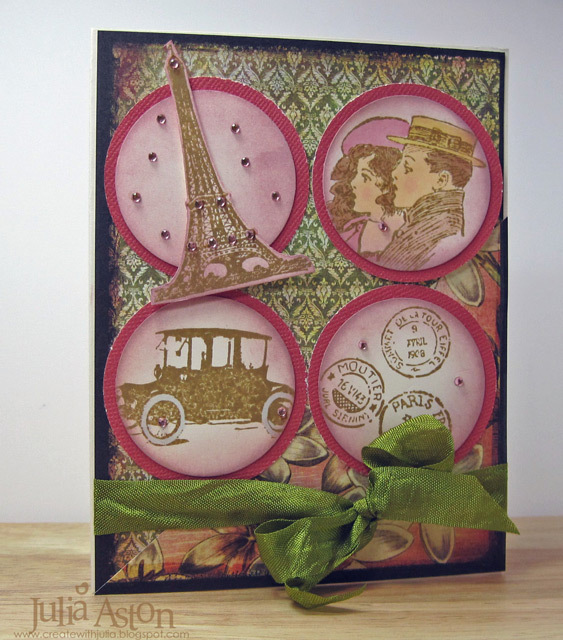 I've also entered this in the Moxie Fab World Christmas Card Challenge as well as the Moxie Fab World Gift box challenge. 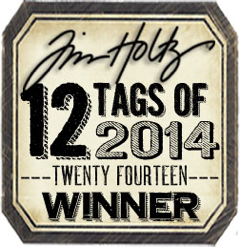 Stamps: Frame It, Holiday Labels No. 14, Compliments of the Season (to be released 10/7/10), Afternoon Tea, Afternoon Tea Sentiments. Paper: Ocean Tides, Vintage Cream - PTI, DP My Mind's Eye Beloved. Ink: Memento Tuxedo Black, Ranger Distress Ink - Old Paper, Bundled Sage. Accessories: Petite Oval & Circle Nestabilities, Snowflake Shapeabilities, ink applicator - Inkssentials Ranger, wrinkled seam tape - www.PrairieBirdBoutique.etsy.com , ocean tides twill - PTI, rhinestones - Michaels, scor tape, foam dimensionals, corner rounder, lace - from stash, Swiss dots embossing folder. 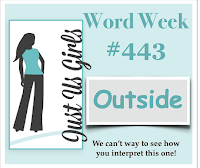 TE Sept Blast from the Past Blog Hop! 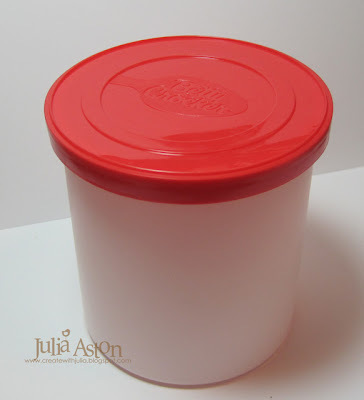 I'm so excited to be participating in the Taylored Expressions Blast from the Past Blog Hop today! Participants have to use stamp sets released on or before June 2010. 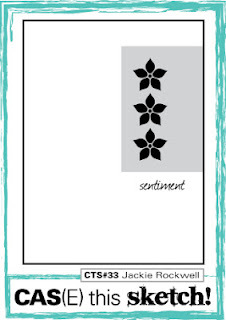 I used two sets on my card today - Fresh Flowers (the window, shutters and flower box) released in April 2009 and A Year of Sweet Sentiments (you brighten my day) released in January 2009. My sketch is a loose interpretation of the one designed by Sankari Wegmen for the challenge today. I stamped the window on a piece of white card stock cut with Labels Nine Nestabilities. The shutters and window box are cut out and adhered with foam dimensionals. I used Copics to color my window. 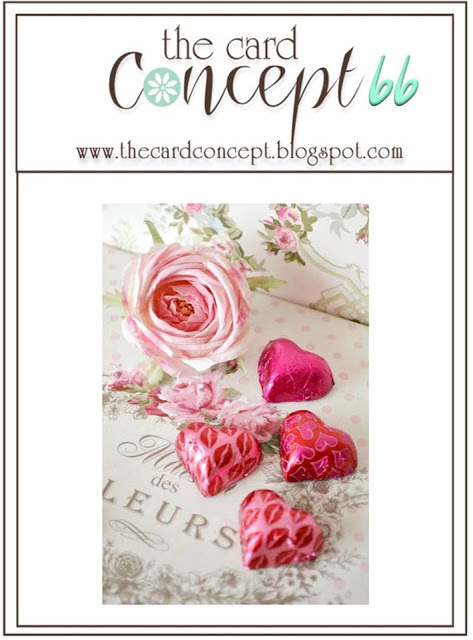 Now check out all the inspiration you'll find from these blog hop participants!! Thanks so much for stopping by today! I hope you enjoy the hop! Stamps: Taylored Expressions - Fresh Flowers & A Year of Sweet Sentiments. 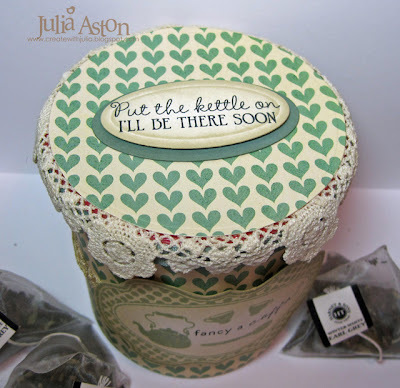 Paper: White, Text Style Green Boutique - PTI, Bazzill Irish Eyes, Bo Bunny Decaf Dot & Seafoam Dot.